Exposing Israeli myth of “no Dams” flooding Gaza. Israel does not have any dams, so they said. Except for the Degania Dam, located on the Jordan River at the southern end of the Sea of Galilee. Israel also has instead a “system of reservoirs”. According to wikipedia, reservoir (etymology: from French réservoir a “storehouse” ) is a natural or artificial lake, storage pond, or impoundment from a dam which is used to store water. 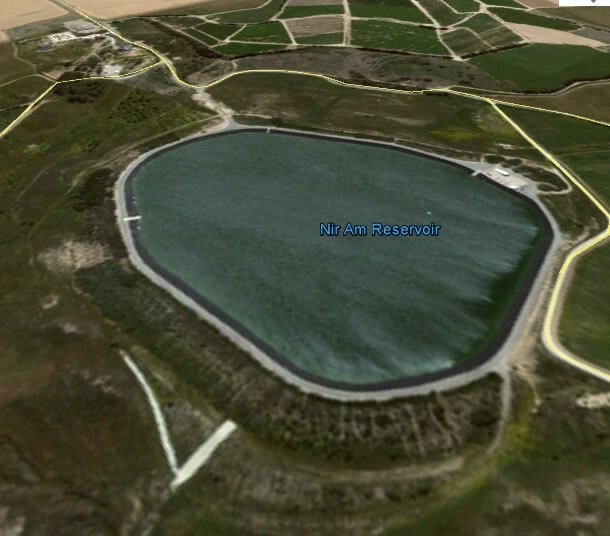 The photo below is of the Nir Am Reservoir that lies near the town of Sderot, in southern Israel. This view of the reservoir shows the Gaza town of Beit Hanoun in the background. Be it an impoundment of water as a result of a dam, or artificially created pond; the result is the same- a large lake of water that can flood or be flooded. Below is an article published in January 2014 exploring the myth of “no dams” and the system of Reservoirs that exist in Israel. The Nir Am Reservoir lies near the town of Sderot, in southern Israel. This view of the reservoir shows the Gaza town of Beit Hanoun in the background. As it turns out, however, there are other dams in Israel, including in the Negev. The desert region also has reservoirs. A click here will take you to a location on Google Maps showing you the town of Sderot in southern Israel. Directly to the west of the town lies the Kibbutz Nir Am, and due west of the kibbutz you will see the Nir Am Reservoir. It sits on a point overlooking Gaza. Move the map to the south and west and you will see four additional reservoirs, all lying along Israel’s border with Gaza. 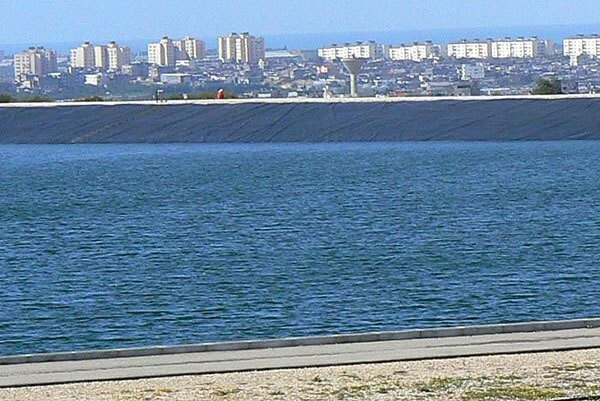 With a capacity of 1.5 million cubic liters of water, the Nir Am is the largest of these five reservoirs, but all are connected. The image below shows what is known as the National Water Carrier of Israel. 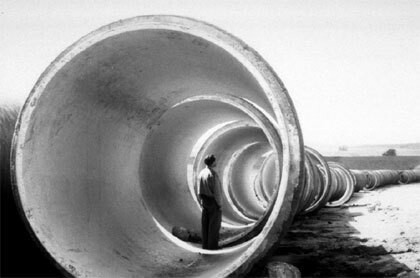 It is a system of giant pipes, canals, tunnels and pumping stations, by means of which water is pumped from the Sea of Galilee in the northern part of the country, down to the coastal areas surrounding Tel Aviv, and finally to the Negev Desert in the south. The system is operated by Mekorot, Israel’s national water company. You’ll note that the blue lines represent fresh water, while the red line leading down around Gaza and into the Negev contains treated sewage. The water in this line is used for agricultural purposes. The National Water Carrier began pumping water in 1964. Here is what the system looked like as it was being constructed. JNF-KKL spread out to the south, to the edge of the Arava. 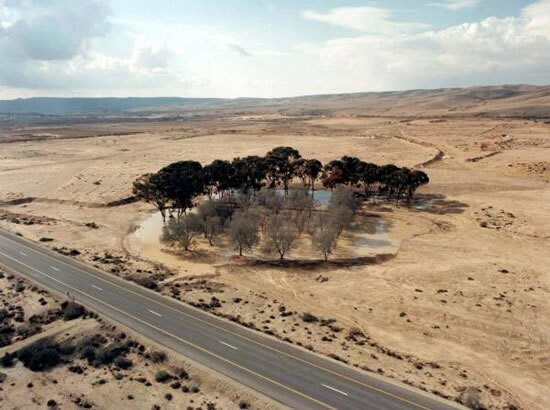 Some 25 percent of all tree plantings in the 1980’s were carried out in the Negev, bringing its forest area to a total of 45,000 acres. Army camps that had been set up in the Negev after the evacuation of the Sinai were planted with JNF-KKL trees to create shelter from the burning sun, shield soldiers and equipment from dust storms, and provide some respite for those soldiers stationed in the harsh desert. JNF-KKL began to focus a large part of its attention on the burgeoning water crisis during this period. Towards the end of the 1980’s, JNF-KKL carried out a number of large-scale water conservation projects, building dams and reservoirs. These vital projects allowed JNF-KKL to capture rainwater run-off when the infrequent rains did fall, water which would have otherwise been lost to the sea. Reservoirs were built in the Arava Valley, at Reshafim in the Beit She’arim Valley, and at Kedma near Kiryat Gat. An artificial lake was built in Timna Park in the southern Negev. Wadi Gaza which flows during the winter season, originating from the Hebron mountains in the east and ends at the sea shore south of Gaza, has been blocked by Israel. Several dams were built along the way preventing the water from flowing into the Gaza Strip which otherwise would have provided a valuable source of water to be used for irrigation and for compensation for the lost pumped out water. There are no known figures of the amount of water this wadi brings, but it would have been a great help to the irrigation in the middle zone of Gaza. GAZA, (PIC)– Hundreds of houses in central Gaza Strip were flooded as the Israeli occupation forces (IOF) on Saturday afternoon opened the earth dams east of the town of Wadi Salaqa in Deir al-Balah. The IOF established many earth dams east of the Gaza Strip to collect rainwater to use it; however in case the levels of water increase they open these dams and water flows to Gaza. The sources added that 300 families have been moved to the shelter center of Hussein School run by the UN Relief and Works Agency for Palestine Refugees “UNRWA” in Jabalya north of the Gaza Strip. The town of Deir al-Balah, cited in the lead paragraph above, is mentioned in a lot of other reports on the Gaza flooding as well. If you once again go to Google Maps you will notice that Khan Yunis lies in fairly close proximity to two reservoirs. Of the five reservoirs Israel maintains along the Gaza border, these are the two southernmost. They are small, but if water somehow were diverted from them, the effect upon the people in the nearby Gazan villages would probably be not inconsiderable. But of course, it isn’t only central Gaza that was inundated in the recent flood. In a story posted at Ma’an News on December 13, reporter Alex Shams reports particularly heavy flooding also in the northern Gaza Strip. BETHLEHEM (Ma’an) — The Gaza Strip was pounded by fierce winds and rain again on Friday as flooding reached dangerous levels in many areas, forcing thousands to flee their homes amid widespread power outages as temperatures plunged into the single digits. The flooding was worst in the northern Gaza Strip, where hundreds fled their homes and water levels reached 40–50 cm in some parts, forcing residents to use boats to navigate their neighborhoods. “An UNRWA staff member reported that there were three meters of water surrounding his house,” he added, pointing out that water had come up to the first floor in some areas. Here’s Jabaliya on Google Maps. Move the map southeast by northeast and you will see the other three reservoirs. Note that all three lie in fairly close proximity to Jabaliya. Let’s turn our attention once more to the northernmost of these — the Nir Am Reservoir. The Nir Am Reservoir is pictured in the photo at the very top of this post. Look real closely at it. You are standing on the southeastern side of the reservoir, looking out across it, with the skyline of the northern Gaza town of Beit Hanoun showing in the background. Below is the reservoir as it is shown on Google Maps, with Sderot to the east, Beit Hanoun to the west, and the reservoir lying in between. And here is the Google Earth view, though from a slightly different perspective — with the side of the reservoir facing Beit Hanoun shown in the foreground. You can also go here and see a series of 30 photos shot as the reservoir was under construction in 1996. Click on any image to enlarge the photos, and then enlarge themeven further by playing with the zoom controls that show up. The photos are under copyright of the Jewish National Fund and are in repository at the Widener Library at Harvard University. Question: Was a means of diverting water from the Nir Am Reservoir into Gaza built into the system when it was constructed, or, alternately, has one been added since? And if the answer to that is yes, did someone, say perhaps from the nearby town of Sderot, feeling himself divinely chosen by God and aggrieved over the landing of the occasional rocket, slip out during the Alexa downpour to pull the switch, open the floodgate, and release the tide? It is probably impossible for us to know the answer to this, but very much worth keeping in mind is the National Water Carrier and its lines running parallel to Gaza’s border. Theoretically the release point, if such exists, would not necessarily have to have been to be at the Nir Am Reservoir. It could be anywhere along this line. Or, there could be more than one release point. Which might explain why especially heavy flooding was recorded in both northern and central Gaza. Or — as I say — there may be no way of diverting any of this water, not so much as a single drop, into Gaza whatsoever…although my own personal hunch is this is unlikely. But one thing is for certain. The hasbara crowd, ever convinced of Israel’s virtue and goodness, ever convinced also of the inviolability of their own “Jewish values,” are of the mind that a deliberate flooding of Gaza is unthinkable, and moreover seem convinced that only the vilest purveyors of “Jew hatred” could even contemplate such a thing. Originally published at Fig Trees and Vineyards.